LOL... Drama! Made me laugh.. And Cakes (+Cupcakes) saved the day! Men please take that advice seriously! Awwww bless you. At least you got your ring back before travelling. But you cried for an hour!!! Goodness gracious - poor Cakes. Loll no moral of the story don't take ur ring off! Is it loose? Or why did you take it off when packing? major drama....i just kept laughing, im usually not overally emotional, so i would have been sad, but definitely not cried. I was two more responses from laughing at you! Do you people see this wicked cousin of mine?!!!!! I know it wasn't funny in the moment but I was calm as soon as I realised that you knew where it was, and that he knew where it was. But I get it...showing the family in person was a big deal. Pele. I'm glad you have it now. Dude, don't take off your freaking ring! 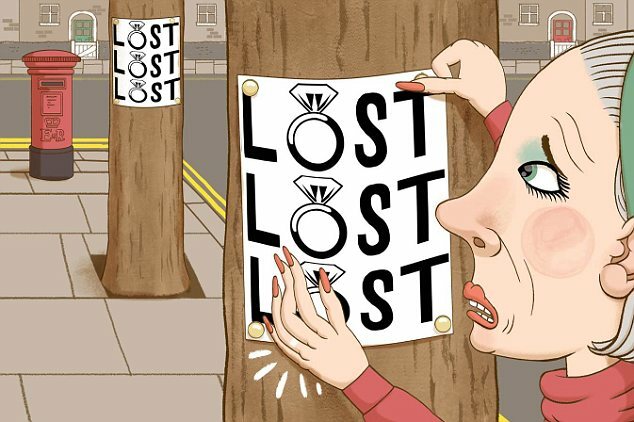 That's how mummy lost her engagement ring. Meanwhile, what's up with all the sweet-tooth names...berry, cakes, cupcakes?? Berry is back! Berry is back!! Berry is back!!! yipeeeee!!!!!!! . Yes I missed you dear. Sorry about your ring dear, thank God you eventually got it before traveling. But you sef, you be cry cry baby. lool. First Kiss stories please. Eniwealth. Your narrative is so funny, at least you got the ring in the end. Have a lovely holiday. I'd like to thank each and everyone of you for your concern during what was a very stressful 4 hours of my life (1 hour of crying + 3 hours of waiting for the ring). In the same vein, so you're laughing at me, shey? Cry baby, enh? is it my fault that I cry sometimes? Is it my fault that some tv commercials move me to tears? Is it my fault that I have feelings, which I feel very much? LOOOOOL!!!! you cried because of ring? hiannnn!!! LOL! Glad you got it back though! Have fun states side! *straightface* dnt just go off like that next time jooor. Glad you have ur "blings" back. Thank your stars Cakes didn't give the pants to the dry cleaners...you for cry palm oil. Did you really cry? Like serious honest-to-God crying? Is that even possible? To cry for a whole hour for no reason? Yes I did, and did you not see the reason?????????????? MY RING WAS AWAY FROM MY HAND, and not on purpose! Hahaha haha! Omg! Bet madame or sir Ninisworld is wickedly ooo. Ya dinoh see a reason for her kwyin like that? Haaa!